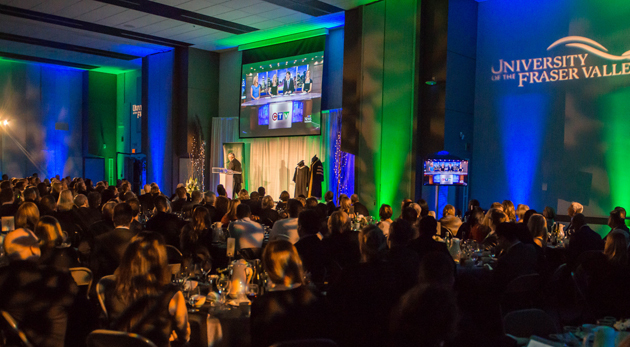 Community and academia joined forces at “Town and Gown”, the University of the Fraser Valley’s inaugural fundraising dinner and silent auction held on Nov 12 in the Great Hall of UFV’s new Student Union Building. UFV and the UFV Alumni Association recognized two outstanding alumni at the event. Dr. Mike Hildebrand, now an assistant professor at Carleton University in Ottawa, was named Distinguished Alumni for 2015. Alex Reimer, an electrician who runs his own business and serves as an electrical inspector, was named Young Distinguished Alumni. Nik Venema, chair of the Alumni Association, introduced the award winners. The gold sponsor for the Town and Gown fundraising dinner was Chernoff Thompson Architects, who designed the new Student Union Building that served as the location for the event. Silver sponsors were Esposito Group, Impark, the UFV School of Criminology and Criminal Justice, and Minter Country Garden Store. Media sponsors were the Abbotsford News and The Patrika. Leader Frames and Save On Foods also provided support to the event.